The holiday was very well organised throughout, relaxed pace. Would definitely recommend to others. Overall excellent. Enjoyed the small group, variety of walks was excellent. It was great to see popular spots but enjoyed majority being quiet less travelled routes. Ulrich was thoughtful, organised and knowledgeable. The hikes were well planned from day one to the end in terms of difficulty and variety of scenery. Ulrich was absolutely wonderful – loved his comments on the geology and plant life. The holiday was very good – we loved seeing Ireland in this manner. Our guide Ulrich was great. So happy to have met him and to have walked with him for 6 days. We saw things we never would have seen otherwise. This was an excellent well-organised holiday. Great hotels, great hotel staff. Our pick-ups were on time. Chosen walks were lovely, though terrain on days 4 and 5 was more difficult. Contact with Go Visit Ireland was excellent. We had an excellent week – Fun! Due to the rain we missed the views on day 5 – we cycled in the clouds! Beautiful everywhere and good variety. We appreciated being on the local roads when possible. I’m not really into holidays where we lounge by a pool all day. Having said that I’m no athlete either, but I do like to move around. 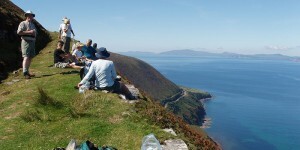 I saw that Go Visit Ireland offered hikes for all levels so I signed up for the moderate Ring of Kerry walks. Moderate is not easy, but it is very doable if you have a reasonable level of fitness. Perfect for me. This was my first solo holiday so it was pretty daunting at first. Go Visit Ireland made it so easy and I cannot fault their organisation at all. All I had to do is turn up on the day. Everything was just right, accommodation on point, communications friendly and they responded quickly to my questions. I must say it is hard to beat a holiday where days consist of walking over misty hills, into ancient woods, skirting loughs and farms – just taking in all of mother nature’s magnificent architecture. Ireland’s human history was also on show, from her first peoples to invasions to famines to the troubles – evidence of it all as we walked that beautiful country. All this with the added bonus of great company and a knowledgeable guide. Our guide Dan was fantastic, he knows the lay of the land like the back of his hands, and literally used his hand to explain to us where things were – “fingers of Kerry”. My evenings dining with new friends and listening to live trad music at local pubs was the icing, or the cherry – both actually. If you want to see what most people will not see on a holiday in Ireland, then this is one way to do it. My only advice is to make sure to pack a pair of waterproof pants – sometimes it rains – a lot. My 60th Birthday Trip to Ireland. The service, prior to and during the holiday was excellent. Transportation, lodging and food – along with a knowledgeable guide – makes this a perfect holiday. Thoroughly enjoyed every aspect of this holiday. We had great walking companions and Ulrich is a wonderful guide. His knowledge of plants, geology, ecology, culture, history, local customs and good pubs is impressive. Each day’s hike was varied and had its own challenges. The Kerry Way walk was outstanding! It was an extremely nice way to see the countryside in Ireland. We really enjoyed the trip. The B&Bs were fantastic. The landscape, food and especially the amazing Irish People. I thought the tour was wonderful. It was a great combination of walking and learning about Irish history and customs. Sean was a great guide – helpful, knowledgeable and accommodating to different levels of physical fitness. I especially enjoyed the variety and the pace – at the end of each day, I felt that I had experienced something beautiful and interesting, in a comprehensive and thoughtful manner. The tour built in plenty of time to explore and experience, so I never felt rushed. The people we met were also delightful and friendly – Ann and Ian, the bus drivers, the bodrhan teacher and the sheep dog owner. I hope to return to Ireland for another of the Go Visit Ireland Tours. Thank you for such a wonderful experience in your beautiful country. We had a lovely time in Ireland. It was one of my mum’s lifetime wishes to visit Ireland and she had the most amazing time. She asked me to thank you for making this trip happen, you were always very kind. Our driver, Mike, was equally pleasant and knowledgeable. Thanks for everything. We had a wonderful vacation in Ireland! The trip was just what we wanted; drive where we wanted to and stay as long as we wanted in places and the BnB booklet worked just fine for that. It was terrific and we met so many wonderful friendly Irish folks. We also were in search of lots of traditional music and we found it!- in many small towns and cities and it was just what my husband was looking for. Thank you for all your help as we planned our memorable trip to Ireland. The hidden Kerry was wonderful. Great, nice mix of varied walks. Beautiful scenery. Friendly people. An excellent trip. We had a wonderful time, our guide was wonderful. Frank was very very knowledgeable. We had a wonderful time. Frank especially was wonderful. Great time, beautiful landscapes. We will see you sooner rather than later! We have been very pleased with every aspect of our trip. Frank Walsh has been an excellent guide. Everything was excellent, we were very lucky. The weather was beautiful all the time. The bikes were very good. All of the landlords were very friendly. Your service was excellent. This travel route was just right for a first trip to Ireland with bikes. We will come again next year. 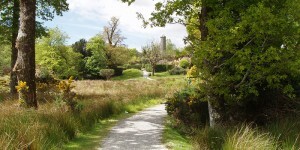 This was my seventh Tour with “Go Visit Ireland” and my second time round the “Ring of Kerry”. Once again I had a fantastic holiday. The accommodation varied from good to excellent. The trip was well thought out and most of the cycling was done on very quiet backroads, where possible. The route instructions were clear and precise and easy to follow. The luggage transfer went off without a hitch. I will certainly be back again, even though I have now completed all the offered Independent cycle tours, cycling in Ireland is a must for every hobby cyclist. For most people cycling on the left might feel strange. However, as most of the time you´re on quiet roads and the Irish motorists seem to be quite considerate towards cycliststhere is no need to be apprehensive. All you need to bring is a reasonable amount of fitness as there are a few small hills to climb, no matter what tour you take. I´ll be 68 this year and, as yet, have not had to dismount and push! Finally, I can´t think of a better way to see Ireland it´s wonderful countryside and culture. Don´t be put off by the weather, in my seven trips (July/August) I´ve only had a total of 3 days of rain, the rest was ideal cycling weather. Very enjoyable week with an excellent guide. Scenery breathtaking and we were fairly lucky with the weather. Beautiful views on every hike. Good to have free day after 2 long hikes. Great guide. 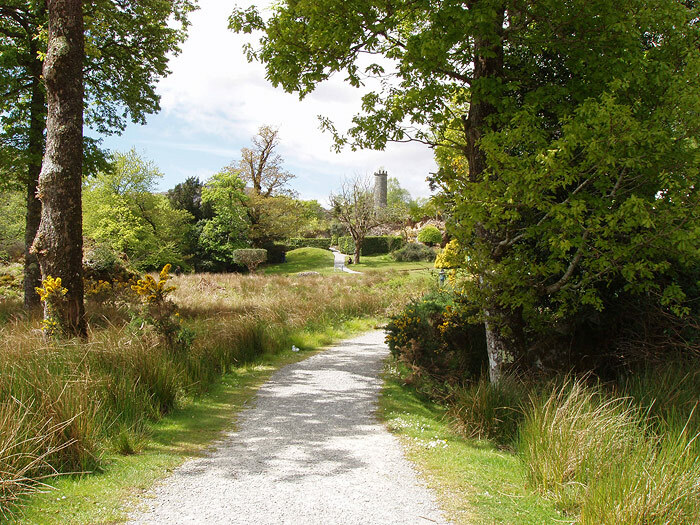 I took the “Hidden Kerry” hiking tour in June 2014. It was a superb trip with amazing hikes among the hills on the Kerry Peninsula. Although I did not think it possible, each hike was better than the previous one! Our guide, Frank Walsh, was very professional, personable, exceptionally knowledgeable, and extremely attentive to the needs of each hiker. Although the scenery itself was worth the trip, all along the way, Frank talked about Irish culture, history and geology which made our hikes even more fascinating. I have been on other hiking tours with other companies and this was, by far, the best – as well as the most economical. The first 4 nights, we spent in Glenbeigh, a quaint Irish country town, and stayed in a spartan, but perfectly adequate, Inn. The last 3 nights were in a luxurious hotel in Killarney and it was quite nice to be pampered a bit after hiking in the National Park. We found the food everywhere to be delicious and the Guinness to be delightful! I highly recommend this company and this tour. I would love to return and take another hiking trip to a different part of Ireland. Great Time. Superb guide. Great holiday. Thank you I have enjoyed a lot my holiday. Improving my English and visiting gorgeous nature places. People have been very friendly as well and the group very nice. Excellent explanations. Thank you for the great guide. Loved the holiday. The guide’s local knowledge and sense of humour made our holiday very special. Hopefully I’ll be able to do another Go Visit Ireland holiday. Absolutely delightful. Everything was handled so expertly and with a friendly touch. Absolutely please. Adored it. Don’t remember the last time I was so rested or smiled so much. Thank you for a wonderful vacation. I’d recommend this tour & the company to my friends. The hikes are well designed. Varied, and interesting. Ulrich is an excellent guide. We had a wonderful walking tour. The itinerary was well planned with the hikes being quite varied- all; beautiful. We can’t say enough about our guide, he was an exceptional guy. The hiking routes were excellent, well chosen for variety of landscape, beautiful scenery, uphill, downhill and level, rocky, boggy and smooth. The guide was excellent. I have been on several week long hiking trips and have had over 30 different guides and Ulrich is by far one of the best. A real asset for Go Visit Ireland. I would also add that the company contact for booking my trip and sending information was very helpful and friendly. Very good holiday, very good accommodation. This walking tour is fantastic. Everything was great. Very good information before the trip. Very friendly and fast. Perfect information & organisation during the trip. Thank you. An excellent and varied walking tour. Cliff hugging pathswith extremely wild winds to undulating walks through mountain passes sunshine and showers! Ulrich the guide is very approascable and knowledgeable who aims to pelase everyone/ A friendly disposition and extremely helpful in makig enquiries on my behalf. He is simply a Gem. Many, many thanks for a memorable week. We both really enjoyed the trip. We thought Ulrich did a great job and was very helpful and attentive to all the needs of the group. We appreciated his knowledge of all the hikes, the routes and the details on the history/ botany/ geology of the areas. Well organised, liked the variety between Lisoonvarna and Leenane. Meals very well organised and food in Leenane was amazing. This was our 6th trip planned by Go Visit Ireland. All have been excellent. Great choice of hikes, very knowledge guide. Excellent, I am already looking forward to my next trip with Go Visit Ireland. Beautiful walks, every day was something different. 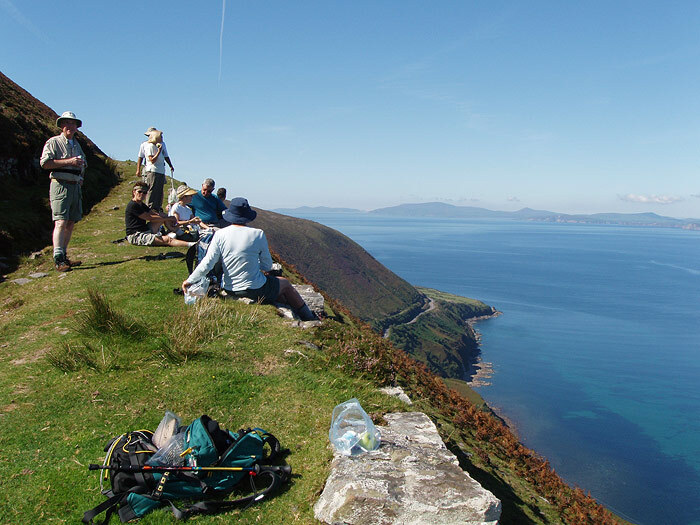 I loved all the walks especially Slieve League. The itinerary is perfect & Ulrich is a wonderful, patient, knowledgeable guide. I wondered whether I was being too ambitioius as I am not much of a walker but after the week I fell confident on the health and strength. I will do more walking! Ulrich is the most interesting, informative and attentive guide. The hikes are each unique and full of breathtaking scenery. Wonderful, variety of activities, beautiful scenery & walks. Smooth logistics. Liked the Bodhran lesson. Appreciate the great skill abd knowledge of our guide. Learned so mush about Ireland- culture, history, wild flowers etc. Great time. Beautiful sights. Everything was great. Very nice. Overall everything was good to excellent and we felt like we got excellent value for the price. I really likes the guide’s personable guiding. We saw and experienced some local things that most tours would not see. All my expectations were exceeded. The choice of sites to visit was excellent. Our guide was full of useful information as well as colourful stories. All of our needs were exceedingly well looked after. I feel we go great value for the price we paid. The food in both locations was excellent. Enjoyed our trip. It was wonderful. Loved the picnic locations. Great guide. We had a wonderful time on our Dingle trip. Fantastic views, great hotel and food, and even perfect weather!